: His name denotes his origin, and it is likely that there is some Whippet in his ancestry. Elegant and graceful, he was bred as a ratter and can still be relied upon to despatch vermin quickly and efficiently. Rat killing reached its peak in the mid-1800s and what dog shows there were, at that time, were usually held in public houses. 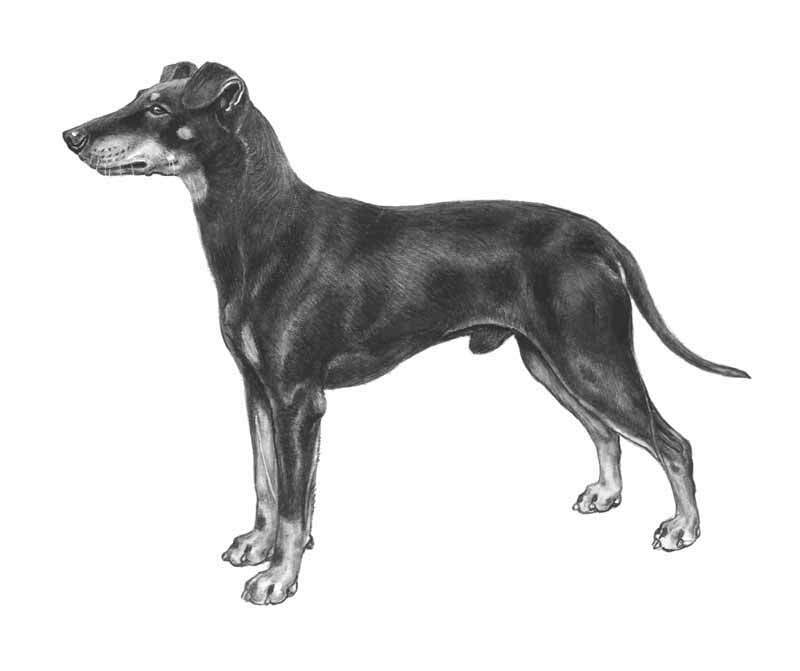 In Manchester, especially, these became a weekly feature and soon this terrier had classes of his own, eventually taking the name Manchester Terrier. : Compact, elegant and sound with substance. : Keen, alert, gay and sporting; discerning and devoted. : Long, flat and narrow, level and wedge-shaped, without showing cheek muscles. : Well filled up under eyes, tapering. : Jaws level, with perfect and regular scissor bite, i.e. upper teeth closely overlapping the lower teeth and set square to the jaws. : Relatively small, dark and sparkling. Almond-shaped, not prominent. : Small and V-shaped, carried well above top line of head and hanging close to head above eyes. : Fairly long and tapering from shoulder to head and slightly arched at crest; free from throatiness. : Slightly arched over the loin. : Cut up behind ribs. : Short and set on where arch of back ends, thick where it joins body, tapering to a point, carried not higher than level of back. : Front narrow and deep. : Forelegs quite straight, set on well under dog; proportionate length to body. : Small, semi-harefooted and strong with well arched toes. : Strong and muscular. Hindlegs neither cow-hocked nor with feet turned in. : Straight, free and balanced with good-reaching forequarters and driving power in hindquarters. : Close, smooth, short and glossy, of firm texture. On head, muzzle tanned to nose, nose and nasal bone jet black. Small tan spot on each cheek and above each eye, under-jaw and throat tanned with distinct tan V. Legs from knee downward tanned with exception of toes which shall be pencilled with black, a distinct black mark (thumbmark) immediately above feet. Inside hindlegs tanned but divided with black at stifle joint. Under tail tanned, vent tanned by marking as narrow as possible so that it is covered by tail. A slight tan mark on each side of chest. Tan outside hindlegs, commonly called breeching, is undesirable. In all cases black should not run into tan or vice versa, but division between colours clearly defined. : Males 41 cms. Females 38 cms.